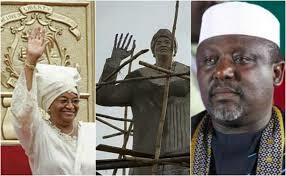 Okorocha set to Unveil Giant Statue of Liberia’s Ellen Johnson Sirleaf – Royal Times of Nigeria. 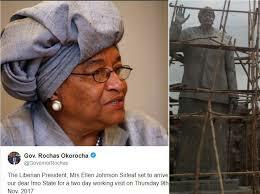 Imo State Governor, Rochas Okorocha via his Twitter page announced that Liberian President Ellen Johnson Sirleaf will be visiting Imo State on Thursday, November 9. A Twitter user, @116Olivia has shared a photo of Sirleaf’s statue taken which will be unveiled on Thursday. According to the Twitter user, who had a little encounter with the NSCDC officials guarding the Imo Hall of fame, there are eight statues in all, two are still under construction.